The Centers for Medicare and Medicaid Services (CMS) just released the 2012 enrollment data for Medicare Part D Prescription Drug Plans (PDPs). These new data dispel any doubts about preferred pharmacy networks’ consumer appeal. Enrollment in preferred network plans grew twice as quickly as overall PDP enrollment. 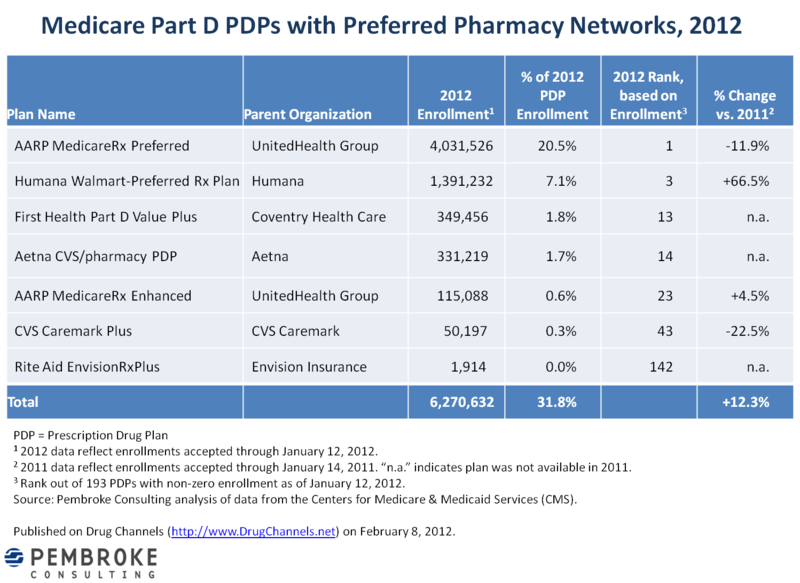 Almost one-third of all PDP enrollees are now in a plan with a preferred pharmacy network design. 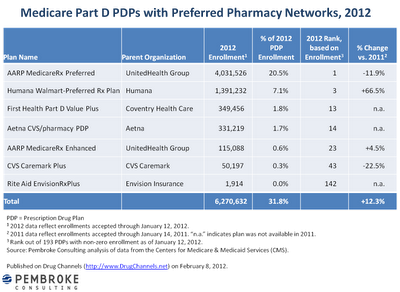 The Humana Walmart-Preferred Rx Plan, the preferred pharmacy network PDP launched in October 2010, is now the third-largest PDP. Two of the three new preferred network plans in 2012 attracted more than 680,000 enrollees. The PDP with Rite Aid as the preferred pharmacy was a bust. Once again, we see how the power of competition is lowering drug costs for seniors. Needless to say, pharmacy owners who neglected to join a preferred network are complaining. A Preferred Network gives the consumer a choice of pharmacy but provides financial incentives to use the particular pharmacies that offer a cost or performance advantage to the payer. Historically, the most common example of a preferred network is a benefit design that encourages the use of mail-order pharmacies by reducing a consumer’s out-of-pocket expenses, a.k.a. incentivized (not mandatory) mail. Preferred networks are now expanding into retail pharmacy by providing such incentives as lower copayments or reduced coinsurance amounts to encourage the use of specific community pharmacies. I identify seven Medicare Part D prescription drug plans (PDP) with preferred network structures. Three of these plans were launched in the October 2011 open enrollment period. (See Aetna and Coventry Join the Part D Preferred Network Party.) In all of these plans, a Medicare Part D beneficiary has the option of using other pharmacies, although any copayment or coinsurance will be higher at a non-preferred pharmacy. For more on preferred networks, see the section starting on page 90 of the 2011-12 Economic Report on Retail and Specialty Pharmacies. The report also explains why commercial payers are adopting new network models more slowly. Data on PDP enrollment are freely available from this CMS page: Medicare Advantage/Part D Contract and Enrollment Data. There are 193 PDPs with non-zero enrollment as of January 12, 2012. Here’s a summary of the 7 preferred network PDPs. Enrollment in preferred plans grew by 12.3%, compared with 6.3% in overall PDP enrollment. The Humana Walmart Preferred Rx Plan was the big winner. The plan started up in October 2010 and will be 2012’s third-largest national PDP, with 7.1% of all PDP enrollees. For background on this plan, see Walmart-Humana: An Inevitable Surprise for Pharmacies and PBMs. The new Coventry and Aetna plans will be ranked 13th and 14th, respectively, and have a combined 3.5% of enrollees. The largest PDP, AARP MedicareRx Preferred, lost more than 540,000 enrollees. The AARP plans use the Pharmacy Saver preferred network, which contains primarily supermarket pharmacies plus Target. The Rite Aid EnvisionRxPlus plan was a bust, garnering fewer than 2,000 enrollees. DOH! You will not be surprised to learn that some vocal pharmacy owners strongly oppose preferred network models, presumably fearing greater competition and reduced profit margins. The National Community Pharmacists Association (NCPA), which lobbies on behalf of independent pharmacy owners, claims that preferred network PDPs are being “deceptively marketed to patients and lack adequate pharmacy access for rural Americans.” (source). NCPA has gone farther in a January 9 letter asking CMS to create a Special Enrollment Period so consumers can switch Part D plans. NCPA refers to these plans as “restrictive networks,” which is inaccurate. Preferred networks use consumer incentives to shift prescription volume into the pharmacies that provide lower costs for the payer. Consumers retain the ability to choose their pharmacy, while being partially exposed to the costs of this choice. Four of seven plans even have the name of the preferred pharmacy in the title of the plan itself. To date, there is no data to support NCPA’s assertions about widespread patient complaints among the 6.3 million people enrolled in a preferred network plan. Let’s hope that NCPA has studied up on statistics since their mail order “survey,” which I describe in A Phony Mail Order Controversy. If you can’t beat ‘em, how about competing? With many seniors strapped for money, it's not surprising price will dominate. Few people actually care about their deep and personal relationship with their pharmacist, whatever that is. We need fewer pharmacies of larger scale with bigger discounts and cheaper drugs for consumers. As you are surely aware, independants are almost never approched about being included into a preffered network. Big money likes to play with Bigger money. ie walmart and humana and so forth. Did a quick check for this cprxn and didnt find any info. any links to a website? I can't find a website for CPRxN, but the network is mentioned in this FAQ for Caterpillar employees. The participating pharmacies are listed as Alwan pharmacies, Doc’s Drugs and Sartoris Drugs. Adam, you are comparing apples to oranges. Caterpillar is not a PBM and is not part of the tax-payer funded Medicare Part D program. It has come to an agreement with about 20 or so independents located close to its headquarters in Peoria, Illinois. From this limited circumstance, you can't suggest that independents were left out of part d preferred networks because they simply didn't opt in. Independents were cut out of these networks and the federal government has looked the other way while big business once again stomps on the small business owner. Wow - surely Mr Fein knew that Caterpillar was a self-funded insurer. Comparing this company with a FEDERAL, tax payer funded plan is more than comparing apples to oranges. Guess how many different pharmacies were included on the "preferred list"?? uhum, uhum ... ONE !! 1 !!! UNO !!!! Yeah - let's COMPETE !!! Our website CPRxN.com will be up and running in a week. We now have 360 pharmacies in our network and are growing. Interested pharmacies can contact me for more information by email at tsartoris@docsdrugs.com. I hope you ignore the predictable comments above. Indepependents need to blame someone for marketplace changes. Keep up the GREAT work!!! Thanks for the info, Tony! I'm looking for an economist who can show the economics of one drug channel vs another. Payers need to understand how their dollar is divided and whether a PBM is costing them money or saving them money. PBMs have the power to tilt co-pays in their favor which creates perception by the consumer that a certain option is cheaper, but what is the total cost? Who's paying for all the labor to call millions of Americans every day to get them to shift to mail order? We are all payers, and simply hire insurance companies, their PBMs, pharmacies, and other parties we are not even aware of, to provide service. PBMs have acquired an incredible amount of power to dictate to insurance companies, doctors, pharmacies, and consumers. I'm wanting you to help provide these answers, not to seemingly defend this structure while insulting independent pharmacy owners. I own an independent pharmacy, and have been in other channels in the past. My price, and my cost of doing business, is lower than WalMart's, and Medco's mail order, every day. "Needless to say, pharmacy owners who neglected to join a preferred network are complaining"... I can certainly tell you that I never got an invitation to join these networks. as the “cheapest” premium. She was not interested in switching pharmacies! If Part D confuses those of us in the industry, imagine how it must confuse the elderly patient trying to save a few dollars with a cheap premium. It's definitely costing this woman more in the long run! It couldn't be put any better Anthony! Over my years as a director for 4 independent pharmacies located in grocery stores, I have had numerous opportunities to opt-in to "preferred networks". Like everyone else, I look at the terms, run the numbers, and make a decision on whether or not to sign the contract. And most of the time, I sign the "preferred" contract- the same contract that major chains like CVS refuse in many cases. And if I decide not to participate, then I am prepared to see customers leave and store sales decline. But the issue here is that independents (and smaller chains) were given no choice, and now are dealing with our patients literally be stolen across the street. I will compete all day with chains on service, price, and convenience. But give me the chance to compete, especially when it's our tax dollars that support this program. Otherwise, let's go back to letting the seniors pay cash and let the best pharmacy win. Rob...the ESRX/WAG dispute shows us that customers may not respect the relationship they have with their RPH, or even MD, DDS, etc.